Versatility and Comfort at a Very Attractive Price. The Harmony chair serves as a versatile seat for the sanctuary, banquet hall, or any other room in your facility. A generous 3” dual layer of virgin foam provides lasting comfort. The optional ganging system allows these chairs to be connected for continuous rows of seating. Perfect for multipurpose spaces and churches that host many events! The Harmony chair is part of our Banquet and Multi-function Church Chairs Series, built for churches in need of versatile seating solutions. 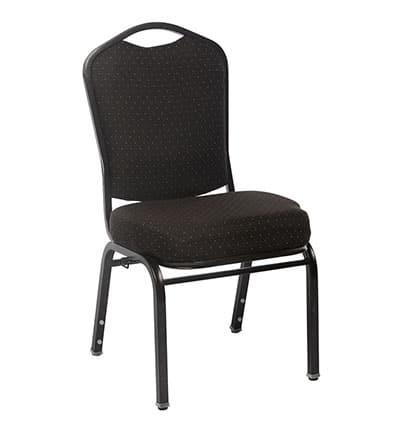 The extra width and foam makes this chair the perfect mix between banquet and auditorium seating. The Harmony’s cushioned seat and dual layer of foam provide maximum comfort, and the 1” steel frame and ⅝” cross bars ensure your chair’s frame will last a lifetime. Optional ganging brackets let you connect your chairs in rows for a continuous, pew-like seating experience. These church chairs are not just for the sanctuary. You can use them in a banquet or fellowship hall, meeting room, auditorium, or any other room in your facility. Our high-quality components guarantee that this chair will stand up to years of wear! High quality full 1” steel frame and 5/8” cross bars. Seat contains generous 3” dual layer of virgin foam for lasting comfort. Fabrics treated with MoistureBarrier™ to protect against stains. Chair fabric is in compliance with JIS 112, the Oeko-Tex 100, and American Textile Restricted Substances List regarding formaldehyde emissions. 1⁄2″ CARB 2 Certified industrial grade plywood seat and back base. Stronger and more reliable than particle board or manufactured plywood. Hand-hold built into the back for easy moving and stacking. Looking for information on measurements and dimensions? View the product spec sheet for our Harmony church chair.